Forum Index > Off-topic Talk > what weapon is the easier to make? Posted: Fri 29 Jun, 2007 11:49 am Post subject: what weapon is the easier to make? I was wondering if the mace is good for a first project and what is the others weapons is easy to make? Iknow it look like an open ended question but i need to know. I'd go for a godendag first. That's just a tapered pine haft, a short length of iron or steel pipe, a steel disk, a short length of square-section steel rod and a nail for a rivet. A little filing, a little drilling, a little hammering. No welding needed. Should be much easier than all the steel cutting and welding you'd have to do for, say, a flanged mace. Plus, the godendag is expected to look rather crude. If you can find a blade, a rondel dagger is quite easy to make, too. Posted: Fri 29 Jun, 2007 6:54 pm Post subject: Re: what weapon is the easier to make? IF you are willing to make a mace from any culture... you can get a rock, drill a hole in it, and put a shaft in the hole. Instant mace. And a very popular item in some parts of the world. a sling. Two leather boot laces and a scrap for a pouch and you can be flinging rocks with the best of them. I used to use mine to throw tennis balls for my dog. slings are great, I made them as a kid to have something to mess with when I was out checking the cows. Also a quarter staff would be an easy and effective one to make..
A club. Or a primitive spear--just a pointed stick with a fire-hardened tip. You can't get any simpler than that. How simple do you want and what sorts of materials/facilities do you have access to?? There are a lot of different things you can make. Don't expect it to be professional quality but they are functional and you can make them with common things found in hardware stores. It depends on the tools an materials you have available. I assume from your question you have a way of shaping metal with fire? All yah need is a wooden rod or dowel a larger dowel and a metal band times 5 and lastley a chain or leather cord and you got yoursef a nice flail. You should be careful when making flails though. Weapons like that are illegal in some places. But as long as you don't run down the street swinging it around your head. You should be fine. When I was a kid, I made a flail out of wooden dowel, a piece of chain, and a corquet ball. :-) It was for a school project back before something like that would have had me expelled. i did one with a shovel haft the only thing that stuck the chain was some big staples i don't have a big budget so we do as we can.. it lasted almost a week . The easiest weapon I can think of making is a spear with a slotted head. All you need is a long dowel, twine and a piece of 16-14 gage steel to cut a head out. 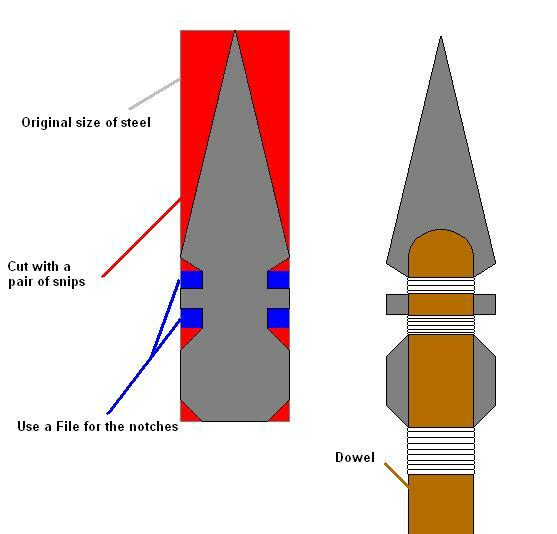 Trace out a simple spear head design on the metal, and cut it out. fix the head to the shaft with twine, and there you have it; a spear. Here is a simple layout of a spear idea. You can use the side of a file to cut the notches into the metal. If you want precise lines, you will probably be able to get them cut at the place you buy the piece of sheet steel/ flat bar; it will be significantly easier on your hands than trying to cut it yourself. it look some kind of primitive, but are you sure that it would be tough enough to resist a blow? I think they are called mourning stars, morning star. What have you. Its a basic pole arm with metal bands and spikes welded to the bands and a center top spike. What I did was found a nice dried piece of iron wood made it into a shaft about 5 foot and made the top wider than the bottom. Took a lil work but came out nicely. It is primitive. That is the kind of spear people made before they knew how to make socket-headed ones. As to the durability, if you get some good, tough twine/thin rope and use one continuous piece to secure the head you should be fine. I actually use this design for arrow heads, I haven't had a chance to adapt them into a spear; but they hold up really well when fired a half inch into wood. I could also draw up a design for a socket head spear I've been fooling around with in my head if you want.